The visitor to Cuzco, alternately spelled Cusco, Qosqo or Qozqo, can’t help but be awed and impressed by a city that was the capital of the Inca Empire. Today’s Cuzco combines the ancient city, colonial additions, and modern buildings and amenities in a splendid reflection of culture and tradition, and reminds us that the sophisticated Incan civilization was not erased by the colonial invaders -- or modern tourists. Qosqo, meaning navel or bellybutton in Quechua, is located in a fertile valley that supported civilization before the Incas, but it is more closely associated with the organized society in which everyone had a role to play, and a function to perform. Ama Sua, Ama Quella, Ama Lulla was the greeting to visitors to the city, and exhorted them “Don’t lie, don’t steal, don’t be lazy.” The results of their artisanry and building techniques are seen everywhere and have outlasted numerous earthquakes. Inca builders laid out the city in the form of a puma, with the fortress of Sacsayhuaman as the head, the plaza of Huacaypata as the belly, or navel, and the converging Huatanay and Tullumayo rivers as the tail. The ancient plaza was the core of the suyos, the Four Regions of the Inca Empire reaching from Quito, Ecuador to northern Chile. The plaza was the site of official and ceremonial buildings and residences of ruling officials and was the locus for the famous road network where swift runners carried communications to all parts of the empire. Surrounding the city were areas for agricultural, artisan and industrial production. When the Spanish arrived, they destroyed many of the structures, and what they couldn't raze, they used as foundations for many of their churches and buildings. Getting to Cuzco today is easier than for the Incas or the colonial forces under Francisco Pizarro, who imposed the colonial city on top of the existing city beginning in March of 1534 after plundering and looting the city. There are domestic and international flights, public transportation, bus service to and from multiple locations, and of course, the train to Machu Picchu. Cuzco enjoys a temperate climate, with the rainy season from November to March and the dry season from April to October. 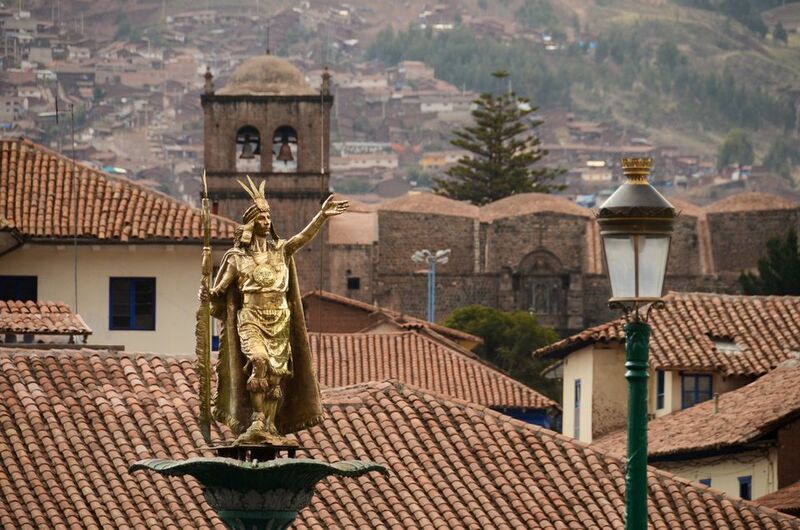 As the Inca capital city, Cuzco is both colonial and modern. It entices visitors to stroll and discover the juxtaposition of Inca architecture, the fabled wall of many angles, colonial red roofs, whitewashed walls and blue doors and windows. Take the time to see the many churches and explore the museums. Marvel at the masonry artistry described in Geometry Step by Step from the Land of the Incas. From the Plaza de Armas, a walking tour takes you to the Cathedral, San Blas church, the Art School and Q'oricancha, the site of the Sun Temple. Qorikancha - the famous sun temple of Qosqo. When it is illuminated at night, we can get an idea of what it must have looked like when it was covered in gold. The cathedral was built over the ruins of the palace of the Inca Viracocha. Q'enqo – This labyrinth with a temple dedicated to Mother Earth is a unique center of worship and for ceremonies. Also called Kenko. Puca Pukara – the Fortress Watchtower on a strategic point along the road to the Antisuyo, or Amazonian region of the empire. it also served as a checkpoint on the Inca road and was a military and administrative center. Do You Spell it Cusco or Cuzco? What Should Tourists See and Do in Cusco, Peru? Can I Travel to Peru With a Criminal Record? Is It Possible to Hike the Inca Trail Without a Guide?